Talent management system software helps you manage the entire employee lifecycle— from recruiting to onboarding to performance management. For this guide, we looked at the most popular options and rising stars and decided to review BambooHR, BirdDogHR, and Namely. These companies covered the range for small businesses in terms of price and ability to grow with your business. We recommend BambooHR as the best talent management system for small businesses because of their great recruitment and performance management features, which are just as powerful, yet come at a lower price tag than the other companies. They also offer a free 14-day free trial. BambooHR received our top vote for the best talent management system software for small businesses because of its affordable price tag, free 14 day long trial period, thorough recruitment features, and easy-to-use performance management add-on module. These 4 aspects made it the top talent management for small businesses for 2017. First, the biggest advantage that BambooHR has over BirdDogHR and Namely is that it has a very affordable price tag that continues to break as the business grows (the amount per employee goes down). They also have a 2 week long free trial, so that you can try it before you buy it, and should you purchase it, BambooHR bills on a month-to-month basis. On the other hand, Namely and BirdDogHR both do not offer free trials, and they lock you into 1 year long or longer contracts with a higher price tag than BambooHR. Despite the lower price, BambooHR does not skimp on features. We found it’s built-in recruiting, employee onboarding, and performance management system to be great, and the interface, in general, very easy to understand. The downside of BambooHR is that it is not quite a full HR solution, unlike Namely, so you will need other software to compliment it (i.e. payroll). However, it is the best, affordable talent management solution for small businesses and it may become a complete HR solution later in 2017, when BambooHR aims to rollout benefits and payroll modules. BirdDogHR got our recommendation as the best for growing business because of its unique add-on features and how those, in addition to the normal talent management system features including its robust recruiting function, make it great for a rapidly growing business that needs to scale up quickly. BirdDogHR’s unique features list include an excellent learning management system that is available in 2 package sizes (40 courses & 100 courses that cover a range of topics), certifications tracking, and ad hoc automated reports that can be automatically emailed to the relevant team members. To me, this says that BirdDogHR is a great system for a company that has a lot of young employees who need training, or whose employee base needs some training elements for job diversification. BirdDogHR also has recruiting and applicant tracking features that rival BambooHR’s and it has an excellent performance management system. We did not give it the top slot though due to confidential pricing and a lack of a free trial. It’s likely going to be better suited for larger businesses (50-200 employees). By contrast, BambooHR offers transparent pricing and a 14 day free trial. Namely is our recommendation if you want a complete HR solution, including talent management, payroll and benefits. While this may sound a bit odd, our reasoning is that, if your business is growing enough for talent management system software, you may also be in the market for these additional features. A few features that are unique to Namely include: full payroll service provision, employee benefits provision, and a great employee engagement feature that is basically a company-wide Facebook feed. Of course, Namely also includes what BambooHR and BirdDogHR include in employee onboarding and performance management, which is why it’s in this buyer’s guide. However, you’ll notice I didn’t mention “hire to fire” when talking about Namely. That’s because the downside of Namely is that they only integrate with other applicant tracking or recruitment partners, and do not have their own internal system like BambooHR and BirdDogHR. Their rep told me that is because they only partner with the best in the business for that area (about 10 integrations), and they know that their partners can do recruitment better than they can. For our readers and to me personally, this is a bit of an oversight on the Namely product team since recruiting is a huge part of the growing small to medium sized business. What Is Talent Management Software? Talent management system software should be an all-in-one solution for hiring, training, and retaining your employees that touches on all of these categories: applicant tracking, recruiting, HR elements like onboarding, and performance management. In previous buyer’s guides, we have looked at other kinds of related software, like applicant tracking software, where the focus is on just job posting and sorting candidates for your hiring process. We’ve also worked on recruitment software, which takes an applicant tracking system to the next step and includes more features. We then created a buyer’s guide on HR software, which is meant to be a full spectrum HR solution including some elements of applicant tracking and recruitment software (or integrating with them). Finally, we have looked at software that only focuses on performance management since that can be a key element as a small business grows. Now we are reviewing talent management system software to provide a higher level solution for our larger business readers who have 25 employees or more and are growing rapidly. Talent management systems are geared towards businesses of 25 employees or more in general, so pricing may seem a bit high at first glance. Keep in mind, however, a good talent management software should save you time and money, both in recruiting costs, and in needing HR department employees working with your employee base. We found BambooHR to have the best pricing, followed by a close race between BirdDogHR and Namely. Both Namely and BirdDogHR pricing depend on your size, but their minimum contracts are into the 5 figures. BambooHR: BambooHR’s pricing is simple. They offer a base package of $99/month for smaller companies of 12 employees or less. Once you hit 13 employees, the price changes to $8/employee/month. Somewhere between 50-100 employees, the price of BambooHR drops to $6/employee/month, and then for companies of 101+ employees, it drops further to $5.60/employee/month. BambooHR invoices on a month-to-month basis and have no binding contract, which is a huge advantage over the commitment required by BirdDogHR and Namely. Also, in the HR software space, the downside to BambooHR was their setup fee. Here, in talent management software, their setup fee is cheaper than BirdDogHR and Namely, and helped push it to our top choice. Their setup training module fee is $200 for companies of under 20 employees. Set up fees go up as employee numbers increase, and start at $1500 for companies of over 20 employees (up to $2000 if you have over 100). BirdDogHR: BirdDogHR has a confidential pricing system that we were able to see on our 3rd call towards the end of our research. We recommend that you go through the quoting process in order to learn what pricing is for your company. BirdDogHR also has setup, training and implementation fees built into its pricing, which it does by 1, 2 or 3 year long contracts. The reps said that nearly every client is on the 3 year contract because of the significant price break, which is nearly 30%, because it eliminates a ton of the annual repeating and set up fees. I was not made clear on how billing works though and how quickly you pay for the contract. In the end BirdDogHR has comparable pricing to Namely if you sign a 3-year contract; if you do not sign that, then they are the most expensive system of our 3 talent management systems here. The set up fee is one time and it’s $5,000. When you start to do the math, $15,000 isn’t that bad. For example, for 35 employees, that’s a cost of $428/employee/year or only $36/employee/month. Since this also includes payroll, benefit provision, and all of the perks of talent management— it’s really not a bad deal for a growing company. Because it includes a very wide range of features, talent management system software tends to be fairly complicated to set up. All 3 companies required me to speak or email with representatives on several occasions before they would offer a quote and discuss implementations. We found BambooHR to be the easiest to setup, followed by BirdDogHR. Namely is the most complex due to its HR features such as payroll and benefits, which require extra steps. BambooHR has a very easy setup process compared to Namely and BirdogHR. The system is simple to set up by one’s self, which is free, or you can pay for a quick start training course for $200 that includes homework and other interactive training. When compared to Namely and BirdDogHR, BambooHR’s expectation of 2-4 weeks of implementation time is by far the shortest. The implementation price is also more reasonable than both of our other featured systems. BirdDogHR – After a 15 minute discovery call, I was then put on a 30 minute “get to know you” call with 2 BirdDog HR representatives. After this call, I was then finally set up on a 2-hour long talent management software demo (the 4 main segments can be done all in one call or piecemeal). There were 2 reps on my account working with me, and both were incredibly friendly and personable. Once we were done with the final demo call, they closed it with a proposal and timeline for implementation. They pride themselves on one of their main points as being quick to implement, and they claim that implementation and setup is 30 days or less per module, but since there are several modules, it is unclear how long it would take to implement the whole system. When I asked about this, it seems that it really does vary according to the reps by each company, so I think a safe range for implementation would be 90-180 days, which makes it much longer than BambooHR. There are also several implementation charges with set up. While they waived one of them since I was asking about the whole package, they still have a significant amount of setup fees that makes BambooHR the clear budget winner. Namely, similar to BirdDogHR, also required a 3 step process in order to get to an actual demonstration of the software. This seemed to be a bit long-winded, especially since there is no free trial of the software, so you can’t just log in and play around to see how Namely works and if it naturally makes sense to you (like BambooHR’s free 2 weeks). Once we were done with the final demo call, they closed it with not even an official complete proposal or cost estimate. Implementation from a PEO to their system can take 3-4 months because of the benefits element; so for a company who is not with a PEO, it may be shorted. The reason for this longer implementation is that Namely is also a full HR solution and offers payroll and benefit services along with its talent management system. There is also a one time charge of $5,000 for a setup fee, which is not horrible considering you are also getting payroll and benefits software. Recruiting costs grow as your business grows, and they can be very expensive if you have high employee turnover or if you need to hire technical talent. As such, we decided that talent management system software needs to be evaluated on their ability to recruit and track candidates effectively. While BirdDogHR has the best recruitment system of the three, BambooHR’s recruitment system is still perfectly suitable for most small businesses. Namely is a distant third in this category because it relies on external systems only. BambooHR: BambooHR has both an applicant tracking and recruitment software included with its package, which is the same as BirdDogHR. BambooHR’s system is complete enough to replace any ATS or recruitment software you already have, but they also integrate with a number of systems (see below)- so if you already use one you love, it might already be connected. You can post job openings directly from inside the system. You can then add hiring managers to each job. The hiring managers then get “pinged” via email when an applicant is ready for them to view. You can also email candidates through the system, save notes, and review them with a stars ranking system. This creates a nice record of communication, so, at-a-glance, you can see where candidates are in the process. You can schedule interviews from the system. You can send offer letters to potential new hires and have them e-signed and stored. 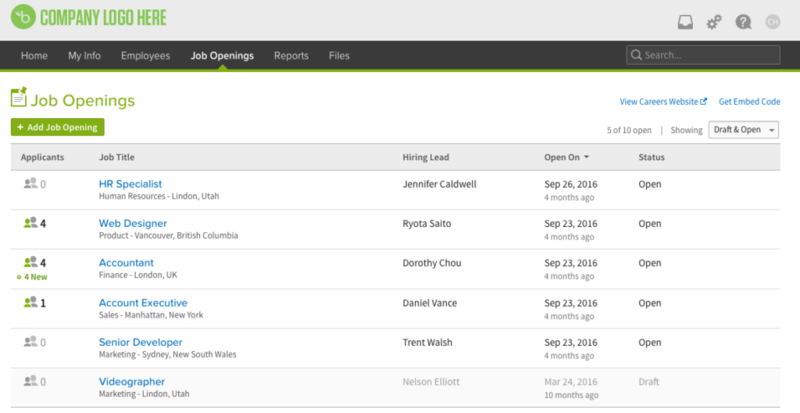 BambooHR also stores the candidates’ information so that say, if you wanted add another role that you filled 6 months prior, you could easily go search through the applicants and top candidates from the last hiring round. To expand on the job boards included, while the names of the job boards were not disclosed, their reps told me that they “push out to all the usual free and small fee job boards” and include up to 350 of those in their systems. They also have paid options with several of the larger partners like LinkedIn. This is pretty similar to BambooHR, except it sounds like even more of an expansive reach, which can be a huge advantage if you have had a tough time recruiting for your small business. Your jobs will then post to job boards and your careers’ portal, plus any social media platforms you integrate to BirdDogHR. You can also send it to your employees to share with their networks. Then, you can customize everything about the application process from the hiring managers involved to how candidates apply. You can email, schedule interviews, and rank candidates in the system. You can also add on an assessment or background checks/drug screening options, which are unique to BirdDogHR. This could make BirdDogHR a standout option for those businesses, like financial services, who require background checks. Aside from the assessments and background checks/drug screens, BirdDogHR also has some add-on reporting elements that can be turned on or off depending on your company size, like Affirmative Action Planning and EEOC diversity tracking. Namely: The one major weakness to Namely as a whole is their lack of recruiting and applicant tracking software included in their software package. However, we still included them in this buyer’s guide because they integrate with several top players in the market that also work well with small businesses. They also have an open API, which is a fancy way of saying, even if your ATS and recruitment software isn’t on here, the softwares can probably “talk” to each other. Namely does not have any intentions to expand into recruiting and applicant tracking; this could make it a deal-breaker for companies with high turnover or constant recruiting needs, making BambooHR or BirdDogHR a better fit. Performance management is a huge component of talent management. Once an employee is onboarded and trained, they need to have goals set and they have to know if they are meeting (or not meeting) those goals. You, as the business owner, also want performance management documented and buttoned up for both good and bad reasons, like promotions and terminations. Overall, all three software systems had a strong performance management module. They were all easy to use and each have comparable features. BambooHR: BambooHR has a performance management system as an add on module at $1/extra per employee per month, which still makes it the budget buy over BirdDogHR and Namely. BambooHR’s performance module is very similar to both BirdDogHR’s and to Namely’s although their appearance is really different. 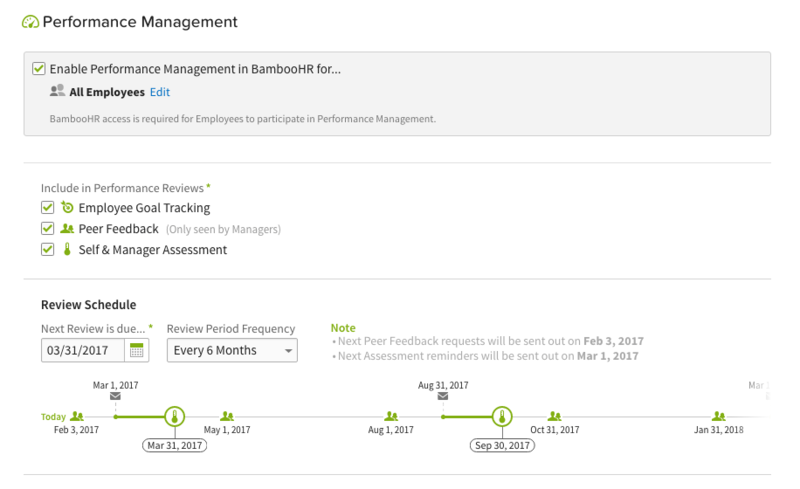 As you can see in the screenshot below, BambooHR makes it easy to set up performance management thanks to a simple timeline feature and other easy tools. The bottom part of the screen (which you can’t see in the screenshot) also lets you set up the broad template of organization-wide performance, which you can then customize for each person, which is similar to both BirdDogHR and Namely’s set up as well. BambooHR also integrates with Bullseye Engagement and Performance Pro, in case you already work with one of them as your performance management provider. 9 box grid evaluations, which are the “hot” performance ratings these days. They are like a visual concept of someone’s performance and are great for comparing employees. Though we do not have any screenshots of the BirdDogHR performance management aspect, I can tell you that it appeared to be as easy to use as BambooHR. Their team was also willing to include setting up of the performance reviews and training for this module in the setup process. Namely: Namely also has a complete performance management system, like the other 2 softwares do, included in its product. There is no fee for this product on top of the contract fees, and it is actually one of the original reasons Namely was created. The ability to track OKRs, KPIS, values- whatever you want to call them- any form of goal setting works! Similar to BirdDogHR, I do not have any screenshots of Namely’s performance management module. Namely’s performance management appeared to be easy to use and intuitive, as much so as BirdDogHR and BambooHR, for both the manager and employees. Our 3 talent management system software options all had excellent and unique additional features that could make them a perfect fit for your small business. We highly recommend considering these features when making a talent management software choice. Company assets tab, where you can track company equipment. This is super useful if you provide computers or other equipment to employees. You can create a custom workflows and approvals to save time on everything, from how to give a promotion to how to get approval for purchasing equipment. They have a great extensive reports dashboard, where you can also create custom reports as well. BambooHR’s extra features would work really well for a tech company, or any company who really values time, efficiency, and process. It’s a system where you can set things up and forget, since they’ll run automatically. BirdDogHR: BirdDogHR has also has a few unique additional features that work well for companies that need regular training – like a call center, large retailer, or manufacturing plant. Employee Onboarding— complete with customizable steps, BirdDogHR has complete employee onboarding with document storage included. Ad Hoc Reporting— these can be customized, scheduled, and automatically sent via email to whoever needs them. Learning Management System— an add-on module that has 2 levels, one which includes 40 online courses and another with over 100 courses. 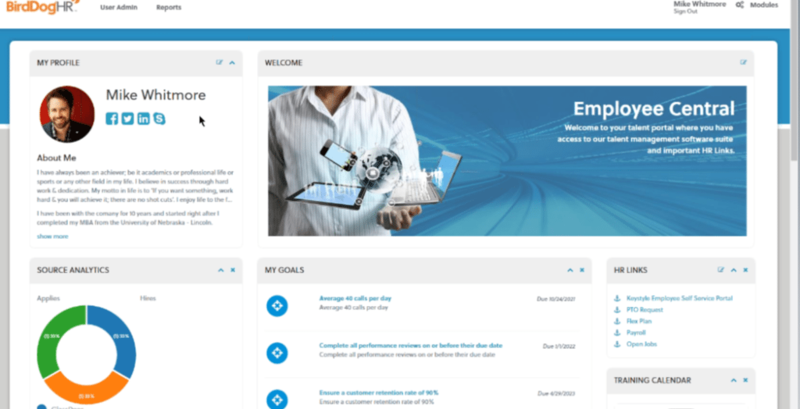 BirdDogHR’s learning management is a great feature for businesses that require regular training or job diversification. Certification Management— if you have employees with licenses, you can program in their licenses and expiration dates- as well as reminders to renew them in advance. Namely: If you are a business looking for an all-in-one HR solution, the additional features section is where Namely stands out over BambooHR and BirdDogHR. While the other two systems have useful additional features, Namely instead has crucial features like payroll and benefits. 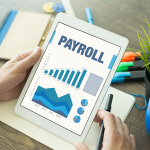 Payroll Provider— Namely is a full service payroll and the filings with payroll are done in all 50 states. Benefit Provider— Namely is a full service benefits enrollment as an independent insurance broker. 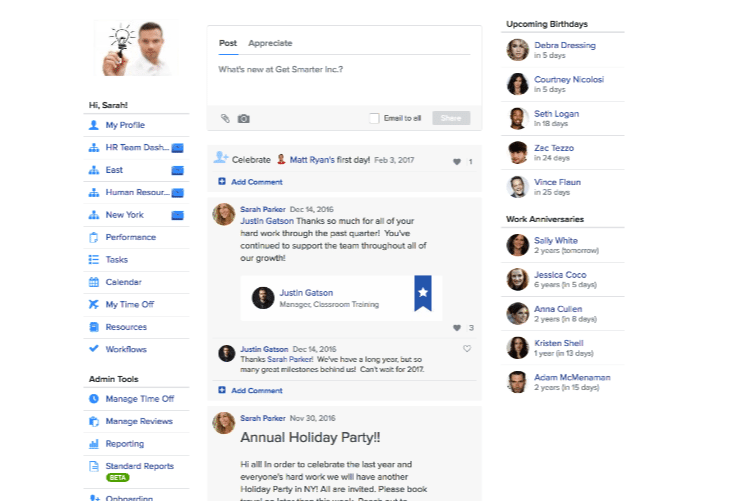 Employee Engagement— Namely has a Facebook-style feed that can be customized for every company and can be incredibly interactive for employees such as discussions, birthdays, and other styles of posts. Employee Onboarding— Namely’s onboarding is a template-driven process; you can set it and forget it. The system will run itself for new employees. Overall, all 3 companies had excellent customer service in terms of friendliness, wanting to learn about the business and how their software could help, and very professional demonstrations. I would imagine that their help teams are also the same. All 3 companies were efficient and effective at scheduling demos, meetings, and answering my questions quickly by email and phone. BambooHR: BambooHR’s customer support has phone support, email support and live chat support available from 8am – 6pm MST, Mon-Fri. Even though they do not work on weekends, I found the customer support at BambooHR to be excellent. The reviews around the web say the same about their customer service: above & beyond at all costs to make the customer happy. BirdDogHR: One of the main points of BirdDogHR’s company motto is Service. They try to have the epitome of customer service in a few different ways. First, you are assigned a dedicated Account Manager who can answer questions for you and always be your point of contact. Next, BirdDogHR’s customer services by phone and email is available from 8am – 5pm CST Monday-Friday, which is nearly the same as BambooHR’s. BirdDogHR customer service folks all sit together in Iowa— so you’ll be talking to a real person who might even be sitting next to the person you spoke to last time. The company emphasized that their current customers appreciate this a lot and that communication between the reps on accounts is thorough. All research on the web points to the same. Namely: Namely gets an edge on both BirdDogHR and BambooHR with its 24/7 email and phone customer support. Neither of the other 2 systems is available 24 hours per day, every day. This could be a big advantage for you if you have a complex schedule or if you know you will also be using it for payroll and benefits.While we didn’t have any exposure to customer service, the ratings online of their customer service are very good, similar to the other two softwares. They are efficient, easy to work with, and resolve your issues quickly, according to various review websites. This is not surprising since the people who did my setup and demo were also professional, friendly, and quick to resolve anything I wanted to know. BambooHR Small Businesses BambooHR is a great all in one talent management solution at an affordable price. BirdDogHR Growing Businesses BirdDogHR is an excellent talent management system that adds on a complex learning component and succession planning. Namely All in One HR Solution With payroll and benefits included, Namely is as close as it comes to a full spectrum HR solution on the market from our research. FairSail Businesses over 200 Employees Not for small businesses, FairSail is still a cool talent management system that seems incredibly easy to use and works primarily in the 200-5000 employee space. Greenhouse Quality Recruiting The go-to recruiting software for techy companies, Greenhouse is not a full talent management system. It is however a great recruiting software. Greenhouse has great data integration and an ability to work with companies that need unique candidates. JazzHR Volume Recruiting Similar to Greenhouse, JazzHR’s name is a bit of a misnomer. It is a recruiting and ATS system that is good for high-volume recruiting with no limits to hires or postings. 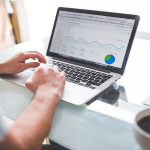 Talent management system software is a great option if your small business is growing at a rapid rate, and especially if you do not see it slowing down at any time. The software can save you time on recruiting, performance management, onboarding, and be a strong basis for an HR department for your small business. Termination, expense reporting, severance agreement, and more.